The Atomic Heritage Foundation has recently received a historic video showing some of the famous scientists who led the race to discover new chemical elements. The video depicts the discovery of mendelevium, or element 101. Produced and narrated by Claude Lyneis, a retired physicist at Lawrence Berkeley National Laboratory, the video highlights the tools and techniques used by the scientists in their exciting discovery. Click here or scroll down to see the video. Scientists have been looking for new elements for hundreds of years. 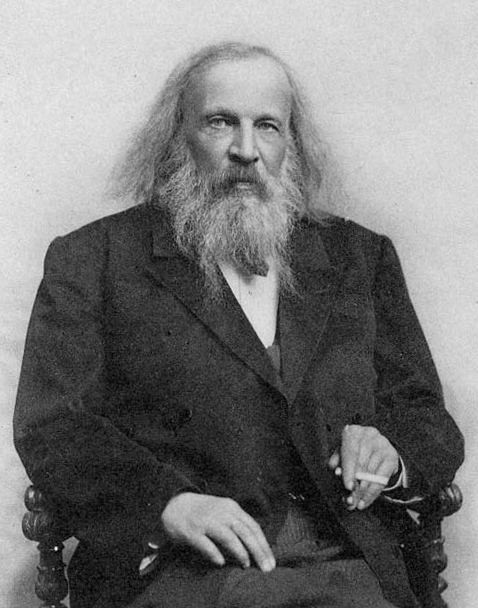 When Dmitri Mendeleev organized the known elements according to a periodic, or repeating, system in the 1860s, there were gaps, elements not yet known but with properties that could be predicted by their relationship to close chemical neighbors. Mendeleev’s table has since been expanded to incorporate new elements beyond those postulated by Mendeleev. Such elements include uranium, plutonium, and mendelevium. Uranium has one of the highest atomic numbers, 92, of any naturally occurring element on earth. Elements beyond uranium, the transuranic elements, existed on earth after its formation, but their shorter half-lives have led to their disappearance over time. The discovery of the transuranic elements thus occurred in the laboratory. While trace amounts of two transuranic elements—neptunium and plutonium—have been discovered in nature, both were synthesized before they were found to occur naturally. The first attempts to produce these transuranic elements began with Enrico Fermi, Emilio Segrè, and their colleagues in Rome. In 1934, shortly after the neutron was discovered by James Chadwick, Fermi and his colleagues used neutrons to bombard uranium, after which they observed new radioactive products. At first, they believed these to be new elements. However, experiments by Otto Hahn and Fritz Strassmann indicated that they were isotopes of smaller, previously known elements, resulting from the splitting of the uranium nucleus. These experiments ushered in the atomic age, and, for a while, the focus of physicists shifted to studying this newly discovered phenomenon of fission. The transuranic elements were synthesized using the same general method Fermi and Segrè used in their experiments in the early 1930s. When a smaller particle collides with a heavy nucleus, the nucleus can break apart into smaller pieces, a process called fission, or the two bodies can fuse to form a heavier element. The collisions of particles at high speeds have led to the discovery of a large number of heavy elements. However, this is not a simple task. It took new techniques and materials, and a lot of luck, to first synthesize these elements. Mendelevium’s discovery began with a bang, or, more specifically, with an explosion in the South Pacific. In 1952, the first thermonuclear device, Ivy Mike, was dropped on the Eniwetok Atoll, a ten-megaton blast that sent a radioactive cloud over 130,000 feet in the air. Samples of that cloud were taken to laboratories in the United States, where two new elements were discovered among the debris—elements 99 and 100, later called einsteinium and fermium, respectively. These discoveries were made in the middle of another nuclear race unfolding in the middle of the twentieth century, one to discover new elements. In the United States, the leading researchers were concentrated at the Radiation Laboratory at the University of California, Berkeley, under the direction of Ernest Lawrence. Using Lawrence’s 60-inch cyclotron, researchers raced to find evidence for new elements. These new elements, they hoped, would unlock the secrets of the atom and open up new areas of research, as the discovery of plutonium did in 1940. Using one billion atoms of einsteinium-253 formed in a reactor in Idaho by the irradiation of plutonium with neutrons, the team of scientists—which included Albert Ghiorso, Stanley G. Thompson, Bernard G. Harvey, Gregory R. Choppin, and Seaborg—devised a plan to produce a new element, element 101. First, the atoms of einsteinium were spread onto a thin gold foil. Since einsteinium has a half-life of about three weeks, the scientists only had about a week after receiving the element to perform their experiments. When Ghiorso calculated the approximate number of atoms of element 101 that would be created when the gold foil was bombarded with alpha particles, he found the number to be much smaller than he had hoped. According to Ghiorso’s calculations, only about one atom of the new element 101 would be created for every three hours the gold foil was bombarded by alpha particles. In order to separate the unimaginably small amount of the new element that would be produced in the experiment, the scientists set up a second piece of gold foil behind the first to catch the atoms that would be knocked loose by the impact of the alpha particles. This piece of foil was rushed up the hill from the cyclotron to the Rad Lab, where it was dissolved and analyzed. The half-life of element 101 was on the order of hours, so it was a race to discover the new element before it disappeared again. In the early morning hours of February 19, 1955, the scientists saw five fission counts, a product of splitting picked up by one of the many detectors, characteristic of element 101, and eight from element 100, fermium. This was the conclusive evidence they needed; element 101 was unknown no more. The discovery of the heaviest atom then known was announced at the end of April 1955. In a press release issued by the university, the exciting nature of the discovery was highlighted: “The atoms of the new element may have been the rarest units of matter that have existed on earth for nearly 5 billion years…The 17 atoms of the new element all decayed, of course, and the ‘new’ element is for the present extinct once again.” The scientists published their discovery in the June 1955 issue of Physical Review Letters, naming their element “mendelevium” in honor of Dmitri Mendeleev and his periodic table. In 1967, a new isotope of mendelevium was discovered, which at the time took over as the heaviest atom known to scientists. What was more exciting, however, was the isotope’s half-life: Mendelevium-258 would last in the lab for months, which dramatically increased the opportunities for further study of heavy elements and their properties. Of the potential of other heavy elements with long half-lives, Seaborg said, “They will add immeasurably to our basic understanding of nuclear structure. I don’t know yet what it will mean in practical terms, but we didn’t know what plutonium would be good for when discovered years ago and now it’s powering ships.” There are sixteen known isotopes of mendelevium. Part of 18 minutes of footage shot by KQED, a public broadcasting station in Northern California, the video depicts the discovery of mendelevium as reenacted by some of the same scientists who performed the experiments. The video dramatically showcases the skill and speed required to synthesize the new element, and the dramatic trip from the cyclotron to the Rad Lab in Ghiorso’s supercharged VW Bug. These techniques put the Berkeley team at the forefront of elemental discovery. 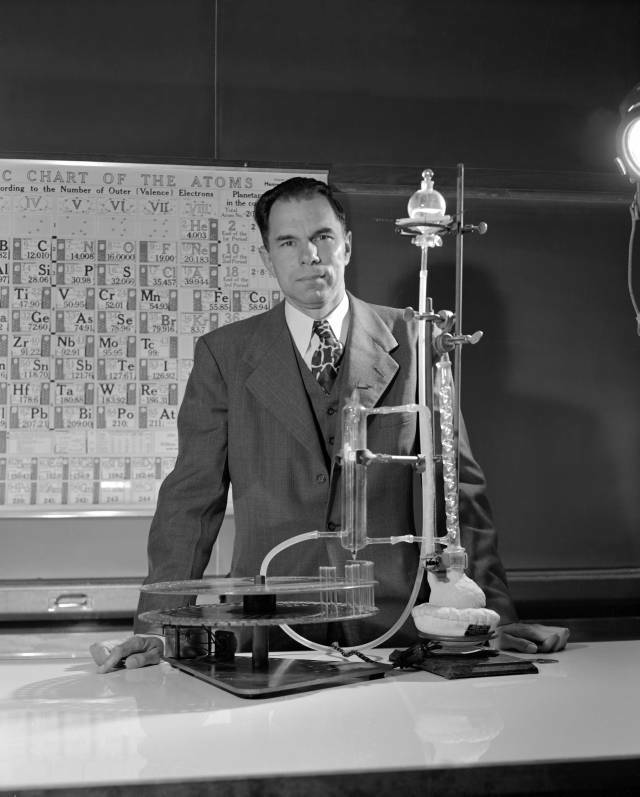 The work of Seaborg and Ghiorso led to the discovery of over a dozen new elements, and helped to expand and change the shape of the periodic table, adding and filling in what is now the actinide series. While the footage may have been originally shot for a documentary on the experimental techniques of the Rad Lab, whether the footage was ever released prior to Mr. Lyneis’ discovery is not known. 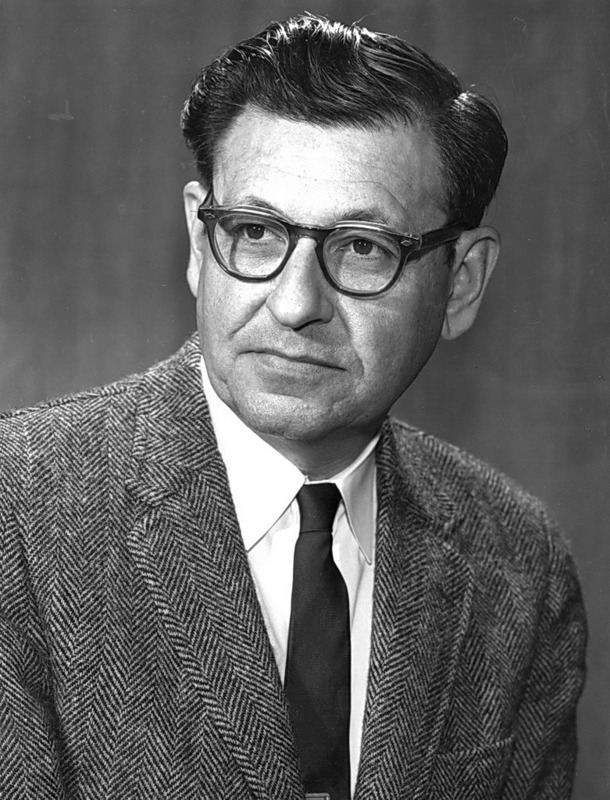 The video was found by Lyneis, a former Director of Operations and Development at the Berkeley lab where the experiments were performed, in a box of films headed for the trash. Lyneis edited the video to add sound effects and narration, explaining the techniques used by Ghiorso and his colleagues over sixty years ago. The box also contained a recording of the 25th anniversary celebration at Hanford, which Lyneis also donated to the Atomic Heritage Foundation and can be seen here. As of 2016, there are no longer any gaps in the first seven rows of the periodic table. Future expansion remains uncertain, but the search for new elements still continues to this day. The Atomic Heritage Foundation is grateful to Dr. Lyneis for his work and explanations of this revolutionary discovery. This video, produced and narrated by Claude Lyneis, depicts the techniques used by scientists to discover mendelevium in the 1950s. Hofman, Sigurd. On Beyond Uranium. Taylor & Francis, 2002. Seaborg, Glenn T. and Walter D. Loveland. “The Search for New Elements,” in The New Chemistry, edited by Nina Hall. Cambridge University Press, 2000.